It felt good to exhale Friday evening after the capture of Dzhokhar Tsarnaev, one of the Boston Marathon bombers. However, news late yesterday that the Royal Canadian Mounted Police thwarted an Al Qaida-linked terror attack on a New York City train bound for Montreal once again unnerved me. I live just 45 minutes from the Canadian border; Montreal is a two-hour drive – that close proximity makes me feel more connected to Canada than the average American. Still, I’m embarrassed to admit that I couldn’t tell you on any given day how their stock market is faring. We’re all familiar with the S&P 500 Index. In Canada, the major stock market benchmark that financial advisers refer to several times a day is the S&P/TSX Composite Index. Whereas the S&P 500 is comprised of 500 large-cap companies, oddly, the number of companies in the S&P/TSX can vary widely from year to year. Currently 237 companies make up the S&P/TSX. So far in 2013 while the S&P 500 is enjoying gains approaching 10%, the S&P/TSX has come under selling pressure thanks to the rout in commodity prices – the crash in the value of gold bullion, in particular. The Canadian benchmark is dominated by commodity stocks due to the country’s concentration of natural resources. In fact, resource companies make up 40% of the weight of the main stock index. 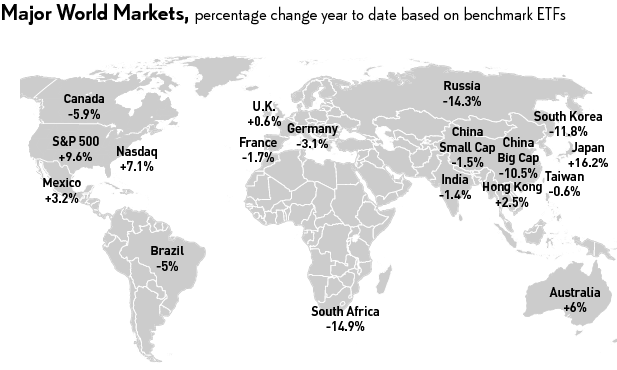 Barrick Gold, the world’s largest gold producer, is a top ten holding of the S&P/TSX. The iShares MSCI Canada Index (EWC) is currently sitting at a level last seen in August after having lost 5.9% year-to-date. My strategy for managing risk triggered a sell signal for EWC in mid-February. EWC is trading below both its 50 day and 200 day exponential moving averages and momentum continues to weaken. At the moment there are no ETFs dedicated to tracking the S&P/TSX Composite Index, but you can achieve equivalent exposure by investing in both iShares S&P/TSX Completion Index Fund (XMD) and iShares S&P/TSX 60 Index Fund (XIU). And what about our neighbor to the south, Mexico? Mexico also has heavy exposure to commodities, yet the Índice de Precios y Cotizaciones (IPC) – Mexico’s main stock index – is still above water in 2013. Mexico’s Bolsa is benefiting from a push for economic reforms introduced by a newly-elected president and that’s attracting investment dollars. For exposure to the Mexican market you can check out iShares MSCI Mexico Capped Invstbl Mkt (EWW). For now my Canada reading: Bear Market, and my Mexico reading: Bull Market.